So you have a recipe that calls for heavy cream right? And the problem is…you don’t do dairy. What is one to do!? Well, since you are here, I’m going to guess you are looking for some dairy free heavy cream right? Fear not! You have come to the right place. My husband has recently taken on the gluten free dairy free diet, so I’m always finding ways to make some of my favorite meals dairy free. Let’s check out how you can make dairy free heavy cream shall we? Full fat coconut milk adds a rich, creamy texture very similar to that of heavy cream, although it will give your recipe a subtle coconut flavor. To make this simple and effective substitute, refrigerate a can of coconut milk, then add a bit of powdered sugar or other sweetener and vanilla to taste. Whisk or mix the coconut milk with an electric mixer until you achieve a heavy cream or whipped consistency. This substitute is also effective in baked goods and sauces for savory dishes, such as poultry and seafood. For a non-dairy heavy cream alternative that packs a fraction of the fat, simply puree tofu to make soy cream. For a substitute that mimics the thickness of heavy cream, use firm, thick tofu. This alternative isn’t as rich as the real thing, but it’s easy to prepare and works well as a thickening agent in baked goods and sauces. A mix of two parts rice milk and one part melted, dairy-free margarine serves as a heavy cream alternative that retains much of the dairy’s rich flavor. Use soy milk or substitute vegetable oil for the margarine. This alternative cream only works in recipes that call for the cream in its liquid state; it is not suitable for whipping. 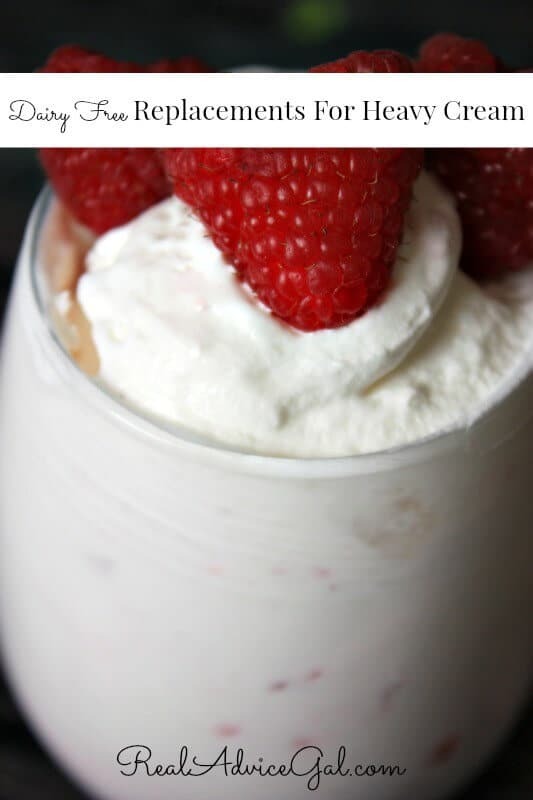 Using 1 cup unsweetened almond milk, ¾ cups of vegetable oil, 1 tbsp maple syrup and ½ a tsp of vanilla extract in a blender set on high until soft peaks form will give you a sweet heavy cream that is perfect for desserts and baking. And there you have it! 4 easy dairy free replacements for heavy cream that are simple and quick to make. They will never know the difference! Enjoy!